The price of copper (COPPER) did not perform well this year, after being amazingly bullish a year ago. What is 2019 going to bring for the price of copper? This article features our copper price forecast for 2019. One very important remark before we look into our copper price forecast for 2019: copper is, similar to silver, a restless metal. It does not rise often, but once it starts rising it goes up extremely fast in a very short time period. We do not want to be invested in the copper market for an extended period of time because the probability of profits is low. That’s why copper is, by far, a market to enter and exit by its chart setups. This is relevant to practically any market in the world, but it applies much more to copper is our point. Let’s start by a supply forecast in the physical copper market. 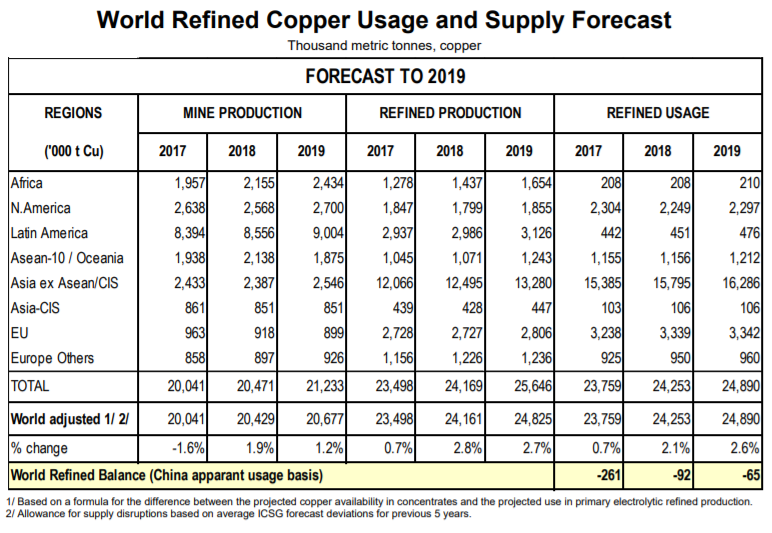 The International Copper Study Group published recently their copper supply forecast for 2019. World mine production decreased by 1.5% in 2017 due to significant supply disruptions and a lack of significant output from new projects or expansions, but is expected to grow by 2% this year. Most of the growth expected in 2018 is due to the recovery from constrained output last year. No major supply disruptions have occurred so far in 2018 and most labour negotiations have been agreed. However, overall growth has been negatively affected by lower output at some mines in Canada and operational problems in China, Peru and the United States. As a consequence the ICSG growth forecast for mine production has been revised down to 2% compared with the previous forecast of 2.9% made in April this year. Growth in 2019 world mine production, adjusted for disruptions, is predicted to be around 1.2% and is expected to be impacted by a sharp decline in Indonesian output. This is the table with the detailed supply forecast as well as the aggregates for this year as well as 2019. The conclusion from the supply forecast: no significant change against this year. The other aspect of copper is its correlation with inflation. Copper might not rise because of supply changes in its physical market but it can certainly move if there is strong inflation. The proof is on the correlation chart below. Inflation and the copper price have a strong correlation in recent years. The key levels to watch for rising inflation: Martin Pring’s inflation indicator above 0.20 suggests ‘inflation is in the air’ while above 0.25 suggests rising inflation, TIP ETF above 106 points suggests ‘inflation is in the air’ while above 112 is a clearly rising inflation trend, AUDUSD above 0.725 suggests ‘inflation is in the air’ while above 0.825 suggests rising inflation. So our inflation forecast is supportive of slightly rising copper prices. If, and only if, inflation indicators break out will we expect a strongly rising copper price in 2019. We have to carefully watch Marting Pring’s inflation indicator with 0.20 as an important level as well as TIP ETF 112 points and AUDUSD 0.725 as an important level. Moroever, the Euro and the copper price are highly correlated especially since 2002. In other words, much will depend on what happens on the Euro chart. As seen below, the Euro is testing (horizontal) support now. There is double support around the 108-112 level. A break below this level would be very bearish for the copper price, and also for the whole commodity complex because it is deflationary. If, and only if, this support level holds strong can we expect support for commodities and copper. In case the Euro rises to its resistance level, say 125 to 127, it will be supportive of copper prices in 2019. With the Euro chart sitting near support, inflation looking to rise mildly (at a minimum) and no significant changes in the physical supply in 2019, we have to turn to the copper price chart for additional indications. We suspect that the copper price will continue to move in its current channel, indicated with (2) on the chart. This would be in line with mild inflation and a Euro that would not break down. In such a scenario our copper price forecast for 2019 is in the range of $2.6 to 3.2. However, if the Euro breaks down we expect the copper price to fall in area (1) indicated on below chart. Our price target for 2019 would become $2.0 to 2.2. How is our copper price forecast performing as 2019 kicks off? What do we see happening on the copper price chart as 2019 kicks off: a breakdown in the price of copper is in progress. Copper has a great chart with clearly distinguished areas. The price of copper now moves from area (3) to area (2) which is the $2.0 till $2.5 area. It started breaking down from area indicated with the number (3) on below chart. However, this is just the start of a breakdown on a monthly chart, so we have no confirmation yet. In terms of this breakdown which is, at this point in time, still in progress, we know that a breakdown is a process, not an event. For confirmation that this breakdown is for real, and not a failed breakdown, we need to watch monthly closings: 3 consecutive monthly closes would confirm this breakdown. Conclusion when it comes to the copper price in 2019: We need more time, also to know if and which copper investment would be recommended short and medium term. In the last few days we have seen strength in the price of copper. Time to review how our copper price forecast for 2019 is performing, and look at it in a sharp way. We suspect that the copper price will continue to move in its current channel, indicated with (2) on the chart. This would be in line with mild inflation and a Euro that would not break down. In such a scenario our copper price forecast for 2019 is in the range of $2.6 to 3.2. However, if the Euro breaks down we expect the copper price to fall in area (1) indicated on below chart. The price of copper rose from $2.5 early February 2019 to $2.87 today, a rise of 14 pct. Interestingly, the bottom of early Feb was exactly at the support line of the rising channel that started in 2016. Really, this is no coincidence! Exactly as forecasted the Euro is holding up and there is a mild inflation so we forecasted the price of copper to continue to move in channel (2) indicated on below chart. We stick to our forecast that copper will trade in the range $2.6 to $3.2 in 2019. The chart below is an update of the one published in January 2019 as well as Nov 2018, both shown above. The copper market does not look bad, but it certainly does not qualify as a market that will bring mega returns in 2019. We are talking the ones we featured in our The TOP 3 Investing Opportunities Of 2019. In other words the copper market is interesting, but not interesting enough. 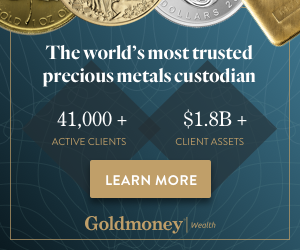 We are not keen on playing this commodity as there are much better opportunities out there in 2019, first and foremost the precious metals market! Just to be clear we go against Frank Holmes his call. He may be super bullish for copper in 2019 as explained here but we believe it is exaggerated. Morgan Stanley expects a 14 pct rise in the price of copper this year. This comes closer to our forecast so our thoughts are closer to the ones of Morgan Stanley. Note that Forbes expects Newmont Mining to be a beneficiary of mildly rising copper prices.